The children have been at school now for a couple of weeks, and I've been trying to use my new found time productively. I've been spending time working on my blog, and I've also been trying to get the house in order. I mentioned before that I've been decluttering for a while now, and something that particularly motivates me is playing the #minsgame, where each day you declutter the same number of items as days in the month. I've picked it up again in September, although as I keep playing I'm finding it harder and harder! I am terrible for hoarding craft things, especially odd bits and pieces that I'm sure I'll find a crafty use for someday. Like this ribbon, salvaged from clothes, gifts, boxes of chocolates and stuffed into a drawer. I also collect pretty patterned paper, buttons, beads and sequins. An area that I don't have too much of a problem with is clothes. I decluttered clothes again when I was packing for our holiday in August. I always find packing for a holiday is a great way to declutter clothing because you can see what you've got and you get to the back of drawers to find the things that are outgrown. I've also been taking advantage of the children being out of the house to go through their toys and books and remove all the things that they've grown out of. I did choose Mia's first day at school to go through their baby board books which with hindsight wasn't the best idea, I did find myself shedding a tear or two as I packed up some of their well loved board books. But the local charity shop had a bumper day when I turned up with all my bags (and I kept plenty of favourites)! I've also been trying to organise their toys a little better. 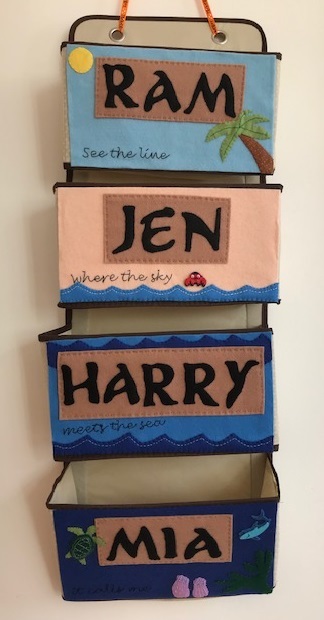 I recently bought this pocket organiser for the back of a door to go inside their toy cupboard and it's been brilliant, it's a great place to stash all the odd little bits and pieces that go with toys and keep them all together. I'm particularly pleased with how well it stores the Barbie type dolls, which along with a few of my old ones Mia is accumulating at an alarming rate. I spent a happy evening brushing their hair and dressing them in different outfits. Mia was delighted to come down in the morning and see them - she thought that they were all new dolls! It's amazing how they don't notice the things that they see every day, and it made me realise the importance of toy rotation and putting things away for a while so that they feel new when they come back out.